Thank you for your interest in Midstate Manufacturing Company. Customer satisfaction and quality begin with the qualified staff and work force. Customer Service and Quality Control teams work closely with skilled employees to assure customer requirements are met. Midstate utilizes the most modern technology and manufacturing equipment available to provide our customers with quality products, on time delivery and competitive pricing. 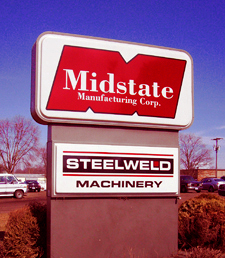 Midstate supplies a diverse range of customers across the United States and globally involved in engine and industrial product manufacturing, foundry, agriculture, machine repair, off-highway equipment, food processing, marine, and power generation with parts which meet their specifications and standards. Since Midstate opened its doors in 1977, it has invested millions of dollars to maintain a modern, efficient, 150,000 square foot facility. Midstate’s ongoing, companywide modernization plan continues to improve processes while reducing overall costs. The success of this plan result in reduced manufacturing process time, higher quality, reduced in-process inventory, and increased return on investment. Modern technologies allow the production of superior quality products at competitive costs, while maintaining the flexibility to respond to customer needs in a rapidly changing marketplace. The use of integrated manufacturing software assists with managing our business from quoting to shipping. The use bar coding allows real time tracking of operations, scheduling and inventories both finished goods and raw materials. Midstate’s Web based and EDI communication further enhance our customer support services.